What things really void your vehicle warranty? A while back we made a joke about voiding the warranty on the van by cutting a hole in the roof. Some people took it seriously and we still get questions about what really is OK to do on a van conversion without voiding the manufacturer’s warranty. The short answer is, it’s completely up to your dealer and Mercedes what they say they will cover or not cover, but knowing what the manufacturer warranty claims to cover and knowing what the law states about warranties is a good starting point for any warranty-based claim you might need to make. Although the dealer might want you to think you need to use them for all your regular services in order to “keep your warranty,” it’s just not true. All you need to do is provide documentation that shows the vehicle was maintained in line with the manufacturer’s recommendations, using the correct quality of components, fluids, and such like. Nothing you do to the van automatically voids the warranty. The manufacturer has to prove that your modification was the cause of the issue that started the warranty-related claim. Most things you do are unlikely to cause this type of problem. Warranties cover defects, not damage. If you broke something while you were working on your conversion, that’s your problem. If it broke while the van was just driving along (and not because something you added dropped on it), it’s most likely Mercedes’ problem. The factory warranty is good for 3 years or 36,000 miles, which ever happens first. So if you drive 24,000 miles per year your warranty will probably only last 1-1/2 years. The engine is warrantied for 5 years/100,000 miles. Note that this doesn’t include the transmission. The emissions system has the same 5/100,000 warranty, because that’s the minimum that the Federal government will allow. In some states you get a 7/70k warranty on some emissions system components on 2016+ vehicles that have CARB compliance. The painted exterior bodywork is also warrantied for 5/100,000. The other panels are warrantied for 3 years/unlimited mileage. Mercedes also offers free towing through the life of the warranty. That’s the 3/36k for most components but (reading the brochure) it looks like it extends to the 5/500k if the issue is caused by the covered parts of the engine itself. The law that defines how warranties are allowed to work is the Magnuson Moss Warranty Act. It defines what can be called a full warranty and what is only a limited warranty. It says what is expected of the consumer and the supplier. Nothing you do to the van automatically voids the warranty. The manufacturer has to prove that your modification was the cause of the issue that started the warranty-related claim. So, if you put so much stuff in your conversion van that you exceeded your GVWR, the manufacturer would find it pretty easy to say you caused additional damage to your suspension, transmission, brakes, or pretty much any other part of the vehicle. However, if you make a hole in the roof to install a fan, they may be able to disallow rust warranty claims in the immediate vicinity that were obviously caused by the fan installation, or even rust on the floor beneath the hole if they could show that the fan seals leaked, but they couldn’t “void” your paint/rust warranty entirely. Adding aftermarket parts is totally allowable under Magnuson-Moss. If you’re going to be doing substantial modifications that involve bolting things on to the body of the van, it’s probably worth reading the Upfitter’s Manual (Body and Equipment Guidelines). This document tells you what Mercedes considers acceptable when you’re modifying the vehicle. Of course, if you add a 1000lb Mad Max steel bumper to the front of the vehicle and it bends the frame rails and overheats the engine, you might not be able to claim for that. The warranty covers defects, not damage. In the same way, doing your own maintenance or vehicle servicing isn’t going to “void” the warranty in any way, so long as you use replacement parts that meet the specifications that the vehicle needs to run properly. That means using oil of the correct grade, suitable air, fuel and oil filters, and so on. Aftermarket, reconditioned, and non-OEM components are allowed. It also means performing those services within the factory-specified timeframes or mileages. That’s why it’s important that you keep a record and receipts for all the work you get done on the vehicle, whether it’s by the dealer, an independent mechanic, or DIY. Judging by the comments on the Sprinter forum, Mercedes will fight warranty claims more than some other manufacturers do. If there’s an obvious defect, you shouldn’t have any trouble. However, if the issue proves to be hard to diagnose or if there’s even the slightest question about who’s at fault, expect pushback. Mercedes seem to be more reluctant to issue product recalls too, preferring instead to just update replacement parts on a continuous improvement cycle. For instance, the NOx sensors in the tailpipe seem to have been a big issue for people who bought early versions of the Bluetech DEF based emissions systems. Later vans use an upgraded version of the NOx sensor. They still have problems, but not to the same extent. Not all of those early vans had their replacements covered under warranty. Obviously, some of the stories on the Sprinter forum could just be the result of a disgruntled owner who didn’t get what they expected, even if the vehicle was actually within specifications. Others though suggest that Mercedes takes a relatively hard line. One of the great things about Magnuson-Moss is that it lets you claim your legal fees if you have to take your warranty case to court (and subsequently win). That means you’ll find more attorneys willing to take on this type of action than some other complaint types. General consensus is that the Mercedes factory extended limited warranty is actually a pretty good deal. Most of the aftermarket warranties are not necessarily so hot. Always read the small print. Don’t feel pressured into buying the extended warranty when you buy the vehicle. You can get the Mercedes extended warranty any time up until the original factory warranty runs out. Be careful though. Even the factory extended warranty doesn’t explicitly cover emissions related items, and these are some of the most expensive-to-replace and not-so-reliable pieces. The US extended limited warranty doesn’t cover repairs in Canada. Also, with the Mercedes extended warranty, the extra years are added to the factory warranty, but the mileage stated in the extended warranty is total. so your 3/36 warranty with an additional 2/125 would become a 5/125. As with the initial warranty, the extended warranty is only good until you reach the first of these two numbers. So if you drive 50k miles per year, you don’t get a 5 year warranty, you get a 2-1/2 year warranty. 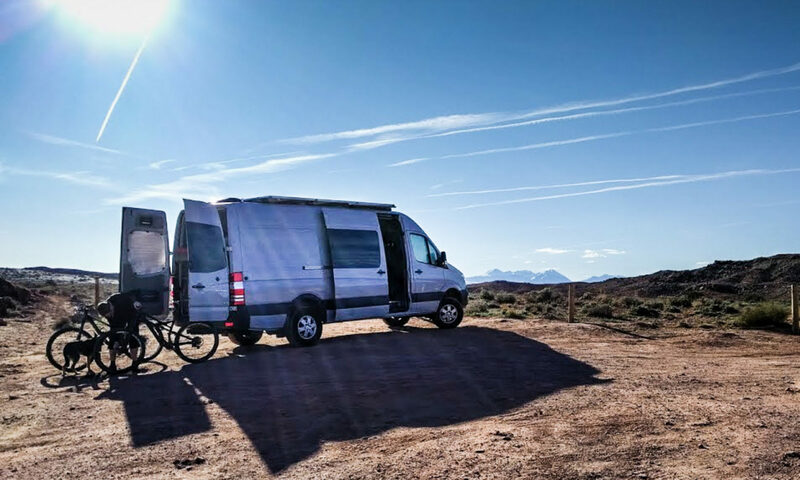 Judging by comments on the Sprinter forum, extending for two years/125k miles should cost around $3k, 3/150k around $4k, 4/175k around $5k – but you can negotiate cheaper if you’re buying it at the time you buy the vehicle. Canadians apparently get a much better deal. In some states (California, Florida, Puerto Rico, Virginia, Washington or Wisconsin) your dealer can’t sell the factory extended warranty because it doesn’t meet that state’s definition of a true warranty. Make sure that if you buy the extended warranty you know what you’re getting – Mercedes or aftermarket. 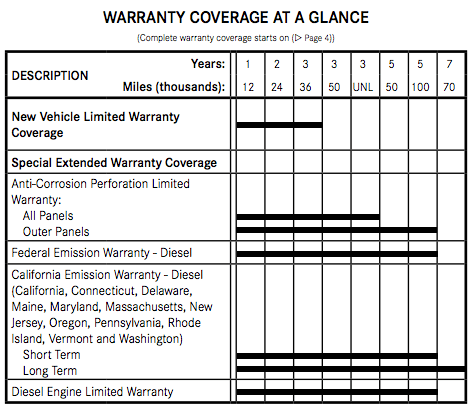 Most non-Mercedes extended warranties you can buy are actually service contracts. The coverage says it will pay for reasonably expected service items outside the normal wear and tear of the vehicle. Often there’s a long list of what is and is not covered, and under what conditions. Sometimes labor is included, sometimes not. Sometimes there’s a deductible too. These service contracts are not covered by Magnuson-Moss. That’s not necessarily a problem, but it means they don’t have to offer the same level of coverage as you’d see in a warranty and it does mean it might be harder for you to fight a legal battle against the provider if you feel they are not covering something they should have. It’s ultimately your decision. Should you stay with the dealer for servicing, or DIY? Is it OK to drill holes in the vehicle’s floor and ceiling, or not? Should you add aftermarket fog lights? None of these things will “void” your warranty. But all of them might potentially make it more difficult for you to make a warranty claim if you need to. Different folks have different levels of risk tolerance and different levels of energy to enter a fight with a dealership if necessary. Some people will scoff at the idea of an extended warranty. Others wouldn’t be without it. The Magnuson-Moss act is incredibly consumer-friendly. It’s one situation where the law is on your side and the system is set up to give you a fair hearing if you feel you’re being stiffed on warranty work. The extended warranty is a form of hedging or insurance. It’s something you hope you never have to use, but it’s reassuring that it exists. It’s taking a bet on the likelihood of having to pay more for repairs than you had to for the extended warranty. Great info. Thanks you.i have an insurance related question. What about converting a cargo to a passenger van with captains chairs and dinette seats with seat belts. Does adding these yourself or by an upfitter allow you to call your van a “passenger” van at that point? Would I just hold my receipts and take pictures of proof to show what has been added? What about DOT regulations, is there a set of rules that shows how things should be placed for safety? Dave, I’ve got no idea what your local registration office would make of that. Our paperwork clearly states that our Crew van is a 5-person vehicle. I’m sure the Cargo starts as a 2-person. How/whether you can get that changed on your vehicle registration is going to vary from location to location. Your insurance company will base their quotes on what your registration says. As for DOT regulations, there are specific tests for pull-out strength of the seats. However, those tests involve – you guessed it – pulling out the seats in a destructive way. So normally it’s only larger suppliers who perform those tests. As a rule, unless you’re creating a very, very solid structure that bolts your seat to the vehicle around/over the chassis rails and includes structurally sound mounting points for a 3-point harness, it’s unlikely that you’d be as safe as the original Crew seat. Previous PostPrevious Why did Mercedes put the trailer wiring box so close to the Sprinter’s receiver hitch mount?